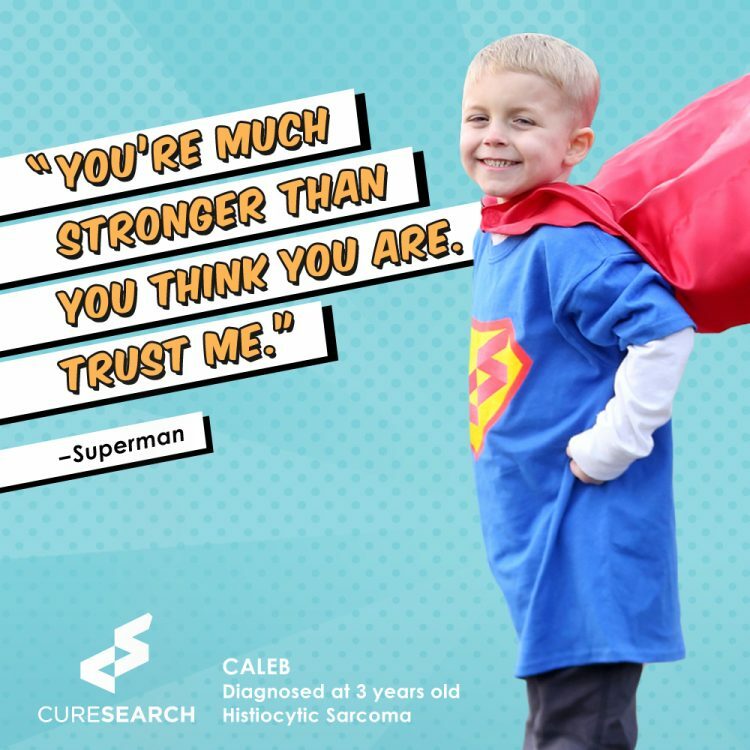 At CureSearch, we believe that children diagnosed with leukemia, rhabdomyosarcoma, neuroblastoma and more are superheroes because they battle one of the most the evil villains known to man — cancer. 1. “Children who battle cancer are superheroes because they don’t let the villain they are currently facing alter their hope for the future.” – Mallory Z. 2. “Children who battle cancer are superheroes because they take on the challenge of treatment with grace, dignity and determination.” – Mary M.
3. “Children who battle cancer stare down the baddest villain, and very often do it with a smile on their face in between rounds of dress-up and Candyland!” – Brecka P.
4. “Children who battle cancer are superheroes because they possess the characteristics necessary to defeat a villain like cancer; bravery, strength, compassion, optimism and willpower.” – Eric R.
5. “Children who battle cancer are superheroes because of their unique traits, creativity, imagination and determination who must fight with all their might, through the longest of nights just to smile at the new sunrise after defeating villains in the dark.” – Amber M.
6. “Children who battle cancer are forever superheroes because not only do they defeat the evil villain cancer one time, but their powers remain with them for a lifetime as they battle secondary cancers and long-term effects from treatment.” – Kelli W.
7. “Children who battle cancer are superheroes because they possess the strongest super powers that come from within. They are the strongest, the bravest, the mightiest of all superheroes!” – Erin. R.
8. “Forget leaping over tall buildings, these kids are superheroes by their strength, perseverance, and the way they still care for everyone else around them! I’ll be a sidekick for each and every one of them!” – Jennifer M.
9. “Children who batter cancer are superheroes because they demonstrate perseverance and grace through the battle.” – Kathy B. 10. “Children who battle cancer are superheroes because they fight with all their might to conquer the beast!” – Sarita S.
11. “Children who battle cancer are superheroes because they never stop fighting! They change the lives of everyone they touch.” – Michelle M.
12. “Superheroes have no interest in being victims — they take on the bad guys head-on. They just fight. That’s what our kids do — they just fight.” – Mary B. Help us fight the villain cancer by donating toward lifesaving research. Help us give every superhero a chance to live a longer, better and healthier life. CureSearch is a national non-profit on a mission to make sure there are better, less toxic treatments available to every child diagnosed with cancer.